Open Labs StageLight 1.3 is different in so many ways, it’s hard to know where to start a review. How about price? It’s a consumer-level PC audio and MIDI recording app (aka DAW/digital audio workstation) that costs a mere $10—less than you pay for similar programs on the iPad. Along with a tablet-style price, it’s also tablet-like in employing an in-app store to sell you more stuff—in this case, some professional sounding loops (snippets of pre-recorded audio, beats, etc.) from artists Linkin Park and Timbaland. Note: See the update at the end of the review for the latest on StageLight 4. Beyond that, StageLight is also one of the first Windows apps that fully embraces the touch that Microsoft so badly wants you to use. Everything is sized and set up for use with your finger or a stylus. A very real bonus to this approach is that the program is super easy-to-use, even with a mouse, and avoids the icon clutter that plagues much of its ilk (Pro Tools, Cubase, Studio One, etc.). If you’re not familiar with those programs, think of Photoshop’s myriad icons and toolbars. When you select a synth track, you can opt to display a large piano with which to enter notes. Everything in StageLight is sized for easy use with touchscreens. 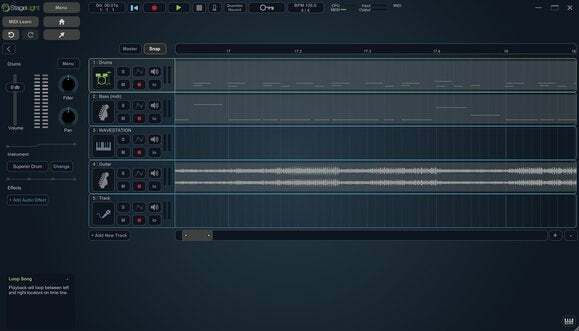 There are a lot of mainstream uses for a program such as StageLight, from quick editing voice-overs to importing MIDI files and outputting them as wave files. You can record that little ditty you hummed on the way home (or to work) and upload it to SoundCloud, or just mess around using the provided loops and samples. 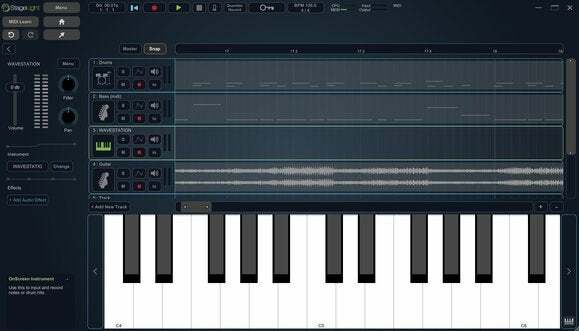 There’s an onscreen piano and a set of drum pads for entering notes (constrained to a key signature if you wish), as well an old-fashioned beat-box step sequencer that lets you draw beats. There are also some decent synthesizers to augment the loop content and effects to make the whole deal sound better. If that were all there were to StageLight, it would still be a great program for the average user. But it’s also a mere step or two away from being a DAW that those more serious about their music could use as a quick-and-dirty creative tool. Open Labs told me it “will continue adding features to extend StageLight’s capabilities for both beginner and professional users alike,” though no time-line was provided. There's a beat-box step sequencer so you can "draw" drum rhythms. It’s somewhat usable as such now, with full support for VST instruments and effects (v2.4) plus audio recording and mixdown at the full resolution of your sound card (e.g., 96kHz/32-bits). Many consumer-level programs limit you to 44.1kHz/16-bit recordings. The deal-killer for pros is the lack of MIDI export—you can’t get your sequences out of the program without jumping through hoops. 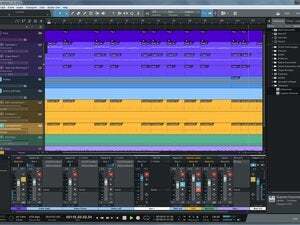 Pros will also miss staples such as audio editing beyond simple part-splitting, a tempo track, and a real mixer view. Also, the volume sliders aren’t granular enough, stepping in large 1db increments. 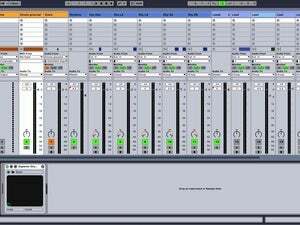 However, there are excellent basic MIDI and automation editing (drawing curves to control volume and other parameters) as well as real time playback control for live performance. At the moment, StageLight is an app just about anyone can use to create tunes, produce ring tones, or simply play around with on break. You might already have it—StageLight ships on many new Dell, Lenovo, and Acer products. Even if you don’t, $10? Seriously? That’s lunch. At least before you start buying more loop packs. But even those are fairly reasonably-priced at $10 to $20 a pop. More serious musicians, be warned; StageLight is a bit of a tease. The interface and workflow are so nicely done, you’ll wish it were a little further down the development path. If it were, you might find your Apple friends jealous of you for once. Update 11/14/2018: Stagelight is now on version 4, and has matured quite a bit with new sounds and better editing. But it's still for amateur beat makers who work strictly with one tempo and time signature. It's a shame, as the program has possibly the easiest interface in the industry. Alas, the price is not longer $10, buy $50 with in-app purchase. After four years of development, with few new advanced features, we no longer consider StageLight real competition for GarageBand. StageLight broke new ground in the PC software market with tablet-like pricing, an in-app store, and touch operation. It's also a worthy PC-side rival to Garageband that's potentially more capable. As of version 3, Stagelight is still missing a number of pro features, but it's still highly suitable for beginners--and there's a free version available. 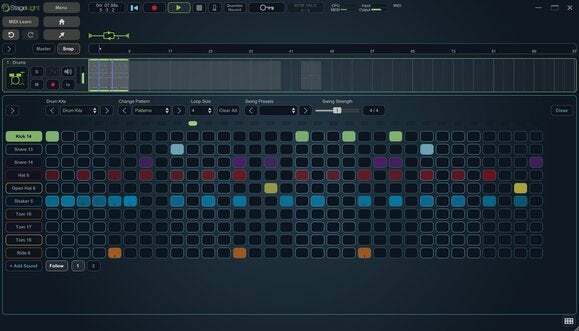 Stagelight is a great program for beat makers and those looking to assemble music from canned loops and sounds. It also sports possibly the best interface and workflows in the industry. That latter makes it a bit of a tease for anyone looking to take their music beyond the basics--there's no varying the tempo, or the time signatures. At $50, the program is also no longer the absurd bargain it was at $10, but is still best suited for amateurs.